If you were asked to name a cultural gathering where people come together at the end of the year, sharing good cheer in the spirit of friendship, with a certain interest directed toward a pine tree, the odds are that you wouldn’t be thinking of the same sort of gathering that is the focus of this article. No, forget Christmas and its 2,000 year old trappings, we’re talking about the Bunya feasts of south eastern Queensland. 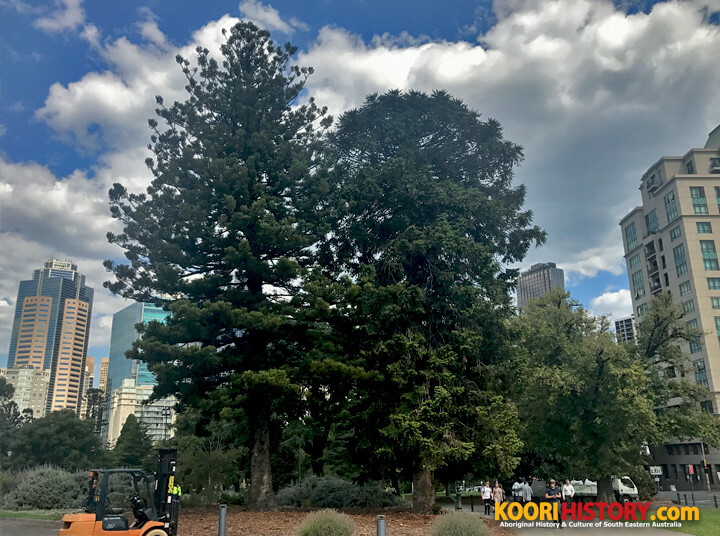 Readily identifiable by its domed peak and particularly ancient looking fronds, the Bunya pine (Araucaria bidwillii) can grow to a height of 140 feet and is both majestic and dangerous when it reaches maturity. The danger that the Bunya tree presents is found in the form of its bowling ball sized pine cones, which have been known to kill when falling onto unsuspecting victims. The cones can weigh as much as 22lb (10kg). A tree will take approximately 15 years to grow to a sufficient age and height (30 ft) before it will produce mature pine cones. Each mature Bunya cone consists of approximately 60 seeds attached to a core. 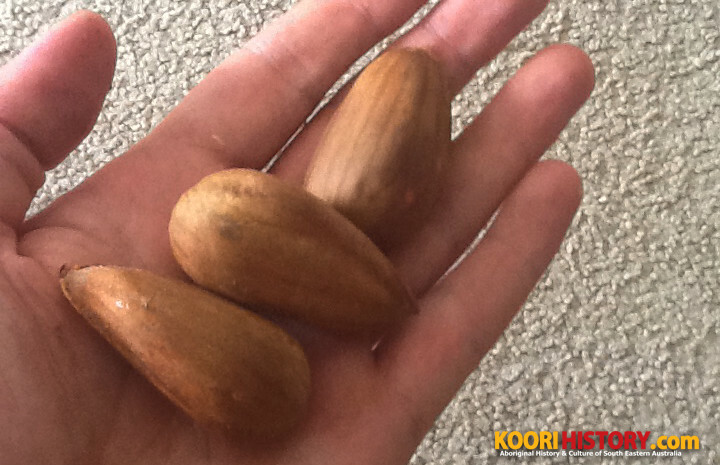 The seeds are edible, having a flavour similar to chestnut. However they do have a tough, leathery texture when eaten raw. The nuts are considerably more palatable when they are roasted, boiled or are ground into a flour for making a sweet bread. Additionally an alcoholic drink was produced by fermenting the seeds by storing them for several months, buried in clay. Bunya trees are indigenous to south eastern Queensland in the area encompassing the Blackall ranges. From late December through to March the seeds may be harvested, however Bunya cones will only develop a plentiful harvest once every 2-3 years. It was during these years of bumper harvest that Aboriginal people from all over south eastern Queensland and northern New South Wales would gather, having been invited by messengers to join the local people in the feast. Each clan, regardless of where they were from had ownership over particular trees, or stands of trees. The family groups would camp nearby and take part in large inter-tribal ceremonies before returning to their own countries. The festival was an opportunity for people to come together in harmony and also for the important business of trade, to share knowledge, stories, song, tools, weapons and dance. Upon venturing home many groups would plant some of the remaining seeds which they had brought with them for the return journey. Stands of trees that were planted in this fashion can still be found as far south as the Clarence River in Bundjalung Country, northern New South Wales. The left hand species is Araucaria cunninghamii aka the hoop pine, scrub pine, Brisbane pine and many other synonyms. In Brazil is Araucaria angustifolia which has foliage and nut similar in appearance and utility to our Bunya.